We support the Kurds to stop ISIS! The ILPS-Philippines condemns the on-going war that ISIS is carrying out in Western Kurdistan (Rojava) Syria. Mass slaughter is being committed against the Kurdish people in Kobanê (Ayn al-Arab in Arabic). With the military intervention of the US and its allies, especially the AKP government in Turkey, the situation is only worsening. This must stop. We call for the support of all peace-loving peoples to stop the ISIS attack on Kobane and extend immediate humanitarian aid to the besieged people. We laud the Kurdish men and women valiantly fighting the ISIS in street-to-street fighting. The right to self-determination by the Kurds and their government has to be respected, fully recognized and defended. About 40 villages have been forcibly taken by ISIS. Over a hundred villages have been evacuated due to bombardments. Many refugees from these villages have gone to the centre of Kobanê. Over 100,000 people have already crossed the border into Turkey. More air strikes by the US and its allies, such as those unleashed in northern Iraq, would only spell more deaths and civilian casualties. For the past two years, Syria’s Kurdish region (Northern Syria) known as Rojava Kurdistan (Western Kurdistan) has been defended by the YPG/YPJ – the People’s Protection Units. In January this year, the Rojava Kurds established local administrations composed of Kurds, Arabs, Assyrians, Armenians and Turkmens. Among these groups are diverse faiths including Muslims, Christians, Yezidis and Alevis. One of the three cantons formed is Kobani, bordering Turkey in the north. All the other areas are surrounded by ISIS. ISIS’s attacks and blockade of Kobanê has been on-going for the past 16 months cutting water and electricity supplies. At the same time, Turkey is applying an embargo against the Rojava. In contrast, Turkey’s border crossings to ISIS territories are all open. The forces attacking Rojava have been organised, armed and sent into Rojava by Turkey. Hence, the 49 Turkish consular staff members recently taken by ISIS were immediately released. Instead of supporting ISIS, the Turkish government must shun it, respect the world people’s detestation of it as a barbaric and terrorist creation of imperialism and respect the Kurdish people’s right to self-determination and democracy. We demand that the Turkish government and military forces to stop the massacre of people in Kobanê and desist from obstructing the needed humanitarian aid corridor for bringing aid from Iraqi Kurdistan Regional Government to Kobanê and other parts of Rojava. 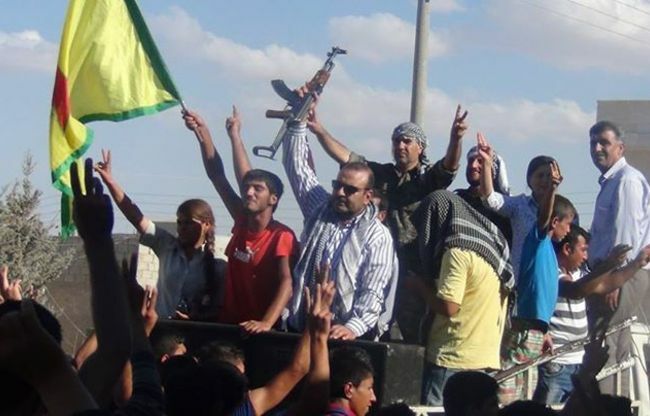 We salute the Kurdish resistance fighters who are heroically battling the ISIS in Kobanê and other areas. We admire and encourage the Sinjar Command of Women’s Guerrilla Army YJA Star (Free Women’s Troops) to deploy their forces in order to lead the fight against the ISIS gangs in Sinjar in northern Iraq.